So, your first thought may be, “Why would I need a LinkedIn profile if I already have a resume and an overly memorized interview speech?” Well, for starters, let’s think about where your resume is right now. It is most likely printed out on a single sheet of paper, (maybe two) sitting in a folder, waiting to be put in the right executives hands and that’s if it ever gets that opportunity. Or, maybe it’s patiently sitting in a designated Dropbox folder waiting to be sent out via PDF file to job listings that you happen to come across on multiple web searches. Hopefully, these two examples have pointed out to you that your resume is not being seen unless you are personally handing it out, but wouldn’t it be nice if there were a public profile on the Internet that could showcase your resume to those seeking candidates for potential jobs without having to ask for it? That’s where LinkedIn comes in. LinkedIn opens up so many doors. It allows you to go beyond your resume, and gives you the ability to share your interests, show the clubs that you are involved with, what organizations you care about, and what volunteer work you’ve lent a helping hand to. You have the opportunity to show potential connections what you look like by uploading your picture to your profile. There is an entire summary section that gives you the freedom to write about yourself, experiences, and what job you may be looking for if you are currently active in the job market. For those who are not in the job market, this section gives you the chance to talk about your accomplishments and your current employment titles. You can basically put your resume on your LinkedIn profile without having to condense the content to just one page, and colleagues, past professors, mentors, and employers can all also write recommendations for you that highly note your connections. Think about it. Can your resume provide all of that? Today, LinkedIn is the largest professional social media site. The company was founded in 2002 by Reid Hoffman, as well as team members from PayPal and Socialnet.com, and was officially launched in May of 2003. The company had a little bit of a slow start and did not become public until the beginning of 2011, but Jeff Weiner, LinkedIn’s current CEO, can proudly affirm that the site has been a booming sensation for businesses, recent college graduates, corporate companies, and recruiters ever since. Now, for those of you who may be opening your mind a little more to this whole LinkedIn social media site, here are some things that potential employers are looking for on your profile. First things first, they want to see your education, skills, past and/or current employment, and everything else that is on your resume. Make sure this information is available to them as well as more in depth descriptions of what you’re interested in, skilled in, and which attributes you’re looking for in your future career path. It is very important that the content on your resume matches with what you are filling out on your profile. Employers also like to see if you have any common connections with them. Although, this part may be out of your control, it is important to make sure that you have made some meaningful connections that can help you network. LinkedIn knows the importance of networking and has made it easy for users to do so. Another key component that employers are looking for is that you have credible recommendations. Do not be afraid to ask those you have worked with or attended school with for nice recommendations, but also do not ask for those you are not deserving of. LinkedIn has made it simple to create a clean and complete profile for users, so they can be at the top of an employer’s hiring list. Aside from being a great place to make a personalized professional profile, LinkedIn is also a place to search for jobs in an area of your choosing. LinkedIn’s career section allows you to be active in your job search instead of waiting for recruiters and future employers to come to you. The LinkedIn careers jobs tab is located at the top of your screen when you are signed in to your profile. All you have to do is click it, put in the location you wish to browse in, and what kind of job you are looking for. It’s simple and has countless jobs available for you to apply to. Through LinkedIn careers you can also stay updated on different jobs available by ‘following’ companies that you have your eye on, the same way you would if you were on Twitter. This perk makes it easy for the user to apply to jobs and for the job poster to go straight to your professional profile and learn more about you. It’s like having an informal interview right away without any initial exchange of words. You should constantly be building your LinkedIn profile. It is difficult to get the hang of it at first, but once you get in the groove of things, it should become part of your daily routine. Always make sure that you have a photo of yourself on your profile. You are way more likely to be found and approached with a picture than without one. Be active in groups. The groups you choose to be in can say a lot about your LinkedIn character. Make sure you choose them wisely and interact occasionally. Reach out and make meaningful connections to help network yourself. When doing so, make sure that you personalize your requests and explain why you would like to connect. Make sure that all sections of your profile are completed—the more information the better. Always research what else you can be doing to make your profile better. There are so many online videos, webinars, and articles on how to network and be noticed on LinkedIn. Do not post a lot. Again, this is not your personal Twitter page. Don’t overshare. Post meaningful, inspiring articles instead. Do not try to connect with numerous people that you do not know. Your LinkedIn connections are all about quality over quantity. Sure, it would be nice to see the 500+ connections next to your name, but allow that to happen over time. Do not give false information. Always make sure that you are able to back up the information you have put on your profile. Do not put your resume on your LinkedIn unless you are actively seeking a job. This makes it to where you are not getting multiple messages in your inbox asking if you have time to speak with a recruiter because it looks like you are in the job market. Do not use LinkedIn as another excuse to connect with only your friends and chat. This site should be treated as part of your job and be handled with professionalism. At this point, it should be fairly obvious as to why LinkedIn is so important in today’s world. If you are still sitting there asking yourself why should I get a LinkedIn profile? Well, you’re already behind. LinkedIn is the number one way to network yourself in a professional manner on the Internet. Some of the first questions many people are asked before even stepping foot in to an interview is, Do you have a LinkedIn profile we can view? Do you want to be one of the very few people that say no? If you already have a LinkedIn and do not keep up with it, hopefully this has helped you realize that you have a lot of updating to do. Almost all recruiters today use LinkedIn to find the employees that they and their clients are looking for. There’s so much you can detail on your profile that you can’t on a resume. Not only is it a way to make a professional profile, it allows you to find jobs through LinkedIn careers. If you want to join the corporate business world, or if you are someone looking to move around the job market, you must have an active, up-to-date LinkedIn profile. You never know what life is going to throw at you and when you might need to start looking for a new job, so why not already be prepared online? We all know you have multiple profiles on social media that you must keep up with, so one that will help your future career should be at the top of your list! Here at CATMEDIA we know the importance of having a LinkedIn profile. We strive to have a strong social media presence on LinkedIn and utilize this site as a major social outlet to share information with our followers and fellow employees. 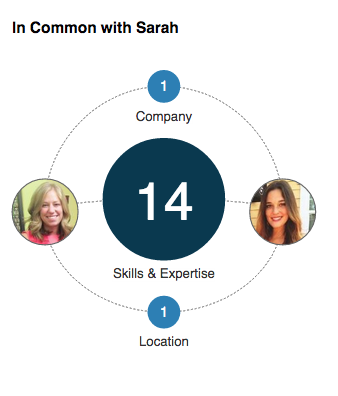 Our employees stay connected through LinkedIn and have been able to build outstanding professional profiles. To stay up to date with CATMEDIA, follow us on LinkedIn! LinkedIn is in 24 different languages. Having a professional photo makes you 14 times more likely to be found. LinkedIn has 45,000 standard skills to choose from for your profile. 400 million members are currently on LinkedIn in 200 countries and territories. 3 million businesses are on LinkedIn (that’s a lot of potential connections and jobs to be aware of). Job very well done. Very direct and easy to read. Outstanding job! Sarah did an outstanding job on making this article very informative and an easy read. The article was very informative and will highly recommend it to all.